This (German) word is ace. It’s like ‘Schadenfreude’ – the (not existing) English equivalent simply can’t hold a candle to it. Comfort food. Right. NERVENNAHRUNG. Hell yeah. Literally: “nervesfood” or “nervesnutrition”, meaning ‘food that you eat when your nerves are short’. And it’s good. I mean, comfort food is great. You can’t have that guy? That chocolate bar over there wouldn’t want anything more than be surrounded by your mouth (right, this is not supposed to sound like that!). Your boyfriend cheated on you? Those peanuts would never treat you wrong! You got fired? No-one will take that cereal bar out of your hands! Comfort eating is emotion-related. 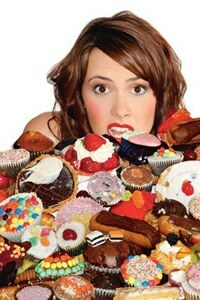 I guess, to some extent everyone is an emotional eater. After all, we all used to be kids and got sweets and treats when we were nice or hurt ourselves. Thus, we learnt to associate good feelings with food, making it the perfect consolation to stress and other troubles – to “achieve some level of improved emotional status, whether to relieve negative psychological effect or to increase positive feeling” (Webster’s Dictionary). This entry was posted on 06/05/2011 by G in Favourite posts, Miscellaneous.